Now that that's out of the way, I'm The Witch's House. Also known as The-Wish-and-Witch-Maker on Tumblr, and Felis-Licht on Deviantart. I also use the same name on this site on the Madoka wiki. 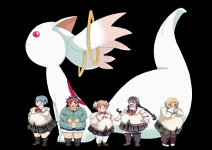 I love Madoka Magica a lot, and my favorite thing about it is Kyubey and the countless witches in the series. So much that I've been making my own witches as part of a small project in my spare time (along with a FC incubator as my mascot). I've been hoping to create more than 100 witches, but RL and the like have ended up putting my project on hold for awhile (but I've been planning some stuff in sketches and notes to keep it going somewhat). I'm also the person who updates the cards on the wiki for witches who don't have any such as Ophelia and Candeloro so they look clean and legit. I aim for quality! IRL, I'm studying and hoping to get into a 4-year college for a job in art and writing in the near future. It's been a dream to share my own creations and stories. So nice to meet someone who makes a hobby in making Witch cards look authentic. I hope I'll be able to commission you when I decide to commission for scene redraws from the different manga installments (which still won't be until I also find anyone capable of the anime's actual art style, not just matching the character designs. And don't worry; I won't fetishize anything to show you). If you're into Lucky Star by any chance, you might also want to check out Unlucky Black Holes, which describes what each of the girls would be like as Witches.